How insensitive of Jermain Defoe to score his spectacular winning goal for Sunderland after we Spurs supporters had suffered through one of the most boring goalless games of the decade at Turf Moor. While Defoe�s goal defies description, there was an easy word to sum up the match at Burnley (in best Eric Morecambe voice): Rubbish! But I take my Tottenham tifter off to the Clarets for the way they suffocated the life out of Spurs in midfield. Paulinho, surely surprised to have started the match, suffered most from the stifling tactics. His contribution to an easily forgotten game was sub standard for a player of his quality, and the Spurs fans on line gave the Brazilian a real roasting. Burnley are fighting for their Premier League lives, and I fully expected them to put the squeeze on Spurs, just as they did in beating champions Man City and holding champions elect Chelski to a draw at Stamford Bridge. I had it down for a draw before a ball was kicked. The couch coaches on line were unmerciful with their criticism of the pedestrian Tottenham performance, few of them giving Burnley credit for their disciplined display. I found myself being accused of being a pompous prat (actually, it was cruder than that) for wanting to praise Burnley rather than burying Tottenham. Spurs were simply not allowed to play, and Our Harry Kane � perhaps weighed down by the unexpected responsibility of team captaincy � had his quietest game since exploding into the consciousness as a huge talent. Let�s be honest, few had thought of him as a first-team player let alone skipper before his goal rush started in November. What I found disquieting was how many fickle fans were turning their guns on Mauricio Pochettino, several I noted among those who had hounded out Harry Redknapp, AVB and then Tim Sherwood. They now have Mauricio in their sights, and the hashtag �#PochettinoOut� has started making an appearance. How short sighted can you be? What do they think yet another change of manager will achieve? It is the fast food generation who are demanding Mauricio�s head, those who want everything NOW. They are the same fans that were singing his praises following the Premier League victories over Arsenal and Chelski and when he guided Tottenham to the League Cup final. The two points dropped at Burnley yesterday makes a Champions� League fourth place about as likely as Nick Clegg becoming Prime Minister, but the fight must go on until it is a mathematical impossibility. Then it�s the close season, when Mauricio must be allowed to select the players he wants to make his system work. He�s not done badly with the squad that he inherited, and he deserves the opportunity to show what he can achieve with hand-picked players. Meantime, the discourteous �Pochettino Out� campaigners should get behind him and not in his way. For several years I nagged and nudged my mate Jimmy Greaves, trying to get him to agree to accept induction to the Tottenham Hall of Fame. It got to the point where he told me to keep my big nose out, so I dropped the subject. Then along came his manager Terry Baker to take up the cause, and he has smoothed the way for Greavsie to join the parade of Lane Legends. 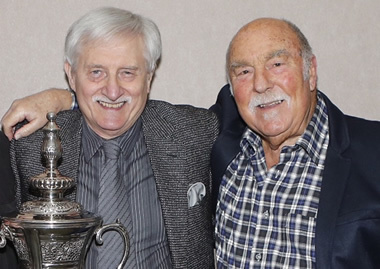 Let�s be honest, the Hall had a hollow echo while record goal scorer Greavsie was missing from the roll of honour. Now we just need to coax 866-game Steve Perryman to become an inductee, and we can then all relax knowing that the masters have got their due recognition. I am told there has been a huge rush for tickets, so if you want to be there you had better book now. We are now into week 14 of the League. The winner at the end of the season will get a huge, personally autographed photograph of Jimmy Greaves holding the FA Cup in 1967, plus a signed, framed certificate announcing you (if you�re the winner) as the inaugural Spurs Odyssey Quiz League champion. Many of you are on a maximum 58 points for the questions asked to date, but don�t worry because there will be a tiebreaker introduced later this month that will stretch your minds and knowledge. Most of you were again correct with the answers to last week�s questions: For three points, which former Burnley player scored a winning goal for Spurs in a League Cup final at Wembley, and for a bonus point name the club he joined from Tottenham. Yes, it was Ralph Coates, who came on as a substitute for injured John Pratt and scored a dramatic winning goal against Norwich City in the 1973 League Cup final at Wembley. He wound down his career with Orient. Sadly, Ralph � a lovely, good-humoured North Easterner from Hetton-le-Hole � left us all too early at the age of 64 in 2010. He had been a popular meeter and greeter at the Lane. First name drawn from the senders of the correct answers is �Big� David Pope, from Leytonstone via Bournemouth. He has supported Spurs since 1964. I will be emailing David a screen version of my Bill Nicholson Revisited book. This week�s challenge is triggered by Saturday�s visit by Tim Sherwood�s Aston Villa: For three points, which Spurs striker was shown the red card in a Boxing Day match against Aston Villa, and for a bonus point from which club did he sign for Tottenham the second time around? Email your answers please to SOQL14@normangillerbooks.com Add your name, the district where you live and how long you�ve supported Spurs. I will do my best to respond.